One of the robbery suspects paraded by the Ondo State Police Command on Tuesday, Ayodeji Bamidele, said he decided to go into robbery to make money to boost his tailoring business. 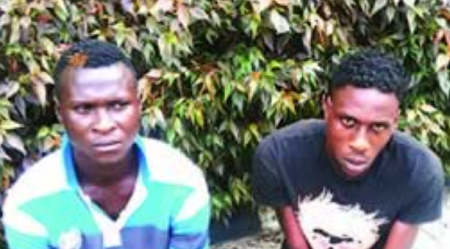 Ayodeji and one Sunday Joseph were arrested in the Ijapo area of Akure, the Ondo State capital, after allegedly robbing a couple. The two men were alleged to be members of a four-man robbery gang in the town before their arrest. The police alleged that the suspects had been terrorising some areas in Akure, the state capital, carrying out different robbery operations. On how the gang operated, the suspect said the leader of the gang, identified simply as Kehinde, organised every operation, including getting a gun. He explained that only the gang leader carried the gun during any operation, while the three other members of the gang took stolen items into the vehicle. “There are other members of the gang, Kehinde and Tope, who have not been arrested, Kehinde is the leader; he carried the gun and we followed him to operate; I don’t carry gun and I don’t kill. That I joined them is the work of the devil,” Ayodeji said. Other robbery suspects paraded at the headquarters of the police command were Innocent Ikechukwu, Victor Ologun, Olaode Aboyebi and Yakubu Kayode. The state Commissioner of Police, Mr. Gbenga Adeyanju, said the suspects would soon be charged to court. “The command is determined to rid the state of criminality, especially during the Yuletide. Once again, we solicit the cooperation of the people of the state by way of prompt information,” Adeyanju said.